Permabond Engineering Adhesives TA4590, a surface activated structural acrylic, was specifically designed to bond electric motor magnets and is non-corrosive to sensitive copper parts or other electrically conductive surfaces. 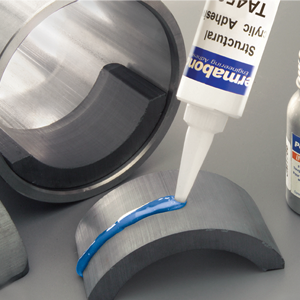 This acid-free, toughened structural acrylic adhesive is applied to the magnet while Permabond Initiator 44 is applied to the can. TA4590 reaches handling strength extremely quickly and cures to form high strength, impact resistant bonds which absorb stress, adding durability to assemblies that may contain brittle ferrite.